Marpa was very happy: In order for you to receive these teachings, I really didn't need this goat. However, there was a purpose in your going to get it. You demonstrated great respect for these teachings, and showed that you're the proper kind of student. Whatever kind of difficulty you're given, you're able to carry through. This shows the strength of your devotion. Lama Ngokpa and all his students assembled for the empowerment, and yet again Milarepa was not allowed to attend. At this point, he was totally depressed. Extremely disappointed, he said: I'm going to jump in the river. I'm going to end it all. This is more than I can take. As he lifted up his things to put them on his back, he reflected that this indeed was a human body he had attained, despite having done a lot of negative things; moreover, in the future it wasn't certain that he would again attain a human body and meet a real lama. So again, he decided to stay but remained in a very distressed state of mind. Through his omniscient knowledge, Marpa knew what was happening within Milarepa's mind. When Dagmema came before him again, she said: Through all these hardships, this wonderful student of yours has neither rejected you nor the Dharma. Not once has he turned his mind away from the Dharma no matter how difficult it was. She begged Marpa to give him teachings. Marpa finally assented and told Lama Ngokpa and his students to fill the shrine with abundant offerings, for that day the guest of honor would be Milarepa. First they made a place for Milarepa to sit because he didn't even have a seat of his own. Then Marpa briefly gave him a teaching on the Dharma in general, which included fulfilling the commands of the teacher and undergoing hardships for the sake of the Dharma. During the initiation of Chakrasamvara, Milarepa experienced directly the face of the yidam deity. Marpa held up a kapala filled with amrita, which functioned as a support for visualization. He dipped his index finger in the amrita and told Milarepa to look at it with great faith. In the sky in front of him, Milarepa saw the full mandala of Chakrasamvara--the main deity and retinue with all the offerings complete. In complete unity with the deity Chakrasamvara, Marpa made a prophesy about Milarepa based on the empty copper pot with four handles that Milarepa had given him when he first came. The four handles represented the four main heart sons of Marpa, of which Milarepa was one. The fact that the pot was empty meant that he was going to have some problems with food during his practice in this life, but Marpa had filled it with melted butter and this meant that, in the future, his lineage would be very fruitful. He would have many excellent students and through them, the Buddha's teaching would spread widely. Gods and men would sing praises to Milarepa and he would be able to prolong his life through the practice of samadhi. Above in the sky, all the gods were happy. In the earth, all the nagas were happy. And in between, in the realm of human beings, everyone was happy. After receiving initiation into the lineage of the deity, the reading transmission, and the secret oral instructions for the practice, Milarepa began his formal practice by going into retreat for eleven months. Balancing a full butter lamp on top of his head, he stayed in a cave that was walled in. Day and night he practiced in this way. At the end of the eleven months, Marpa and Dagmema came see him. Through the sealed cave, Marpa asked him, You've been in retreat now for eleven months. Tell me, what are your experiences? What are the realizations you have achieved? Milarepa had been inside the cave for so long he was hesitant to come out. He didn't feel he could break down the wall himself, as he had taken a vow to be in retreat. Ever helpful, Dagmema said You're right. I'll break it down for you. Then come out swiftly to meet your teacher, for your minds are in harmony. You have not broken any of your promises, so it's all right to come out. The wall to the cave was broken, and Milarepa emerged, made prostrations to Marpa and received his blessing. Milarepa was then led into the circle of disciples. Marpa gave Milarepa a kapala (skull cup) full of amrita, and Milarepa drank it all. Then, together with all the disciples, Marpa gave teachings on the nature of the mind. In addition, he bestowed initiations of various yidam deities, which matured the vajra body, speech, and mind of Milarepa. (It was these yidam deities who gave Milarepa the name Zhepa Dorje, the Laughing Vajra.) There were many auspicious signs at the time, such as flowers falling from the sky. Marpa and Dagmema gave Milarepa another name: Mila Dorje Gyaltsen, Vajra Victory Banner. After the initiations, Marpa gathered all students around him and addressed Milarepa. Great Magician, you are my karmically connected son. I knew this from the very beginning. When I was plowing the field, that was my way of going out meet you. (In Tibet, there is the tradition that when someone important comes, you don't wait home, but you go out to meet them. The more important they are, the farther out you meet them.) However, you had killed many people and other sentient beings. In order to purify these negative actions, you had to go through all trials. Eight times you were thrown into despair. All these occasions were to purify negative actions, to make stronger your renunciation of samsara. Now, during this time, my wife, Dagmema, who has great compassion, was very kind to you. She gave you food and comforted you again and again, but this made for an imperfect situation. She did not challenge you enough, and, therefore, not all of your negative actions have been purified. You must go to a solitary place in the mountains and practice in retreat to slowly purify yourself of these negative actions. Although you went through great difficulties, never did you have wrong views, either about Dharma or myself. This is very wonderful: due to this circumstance, in the future your students will be genuine practitioners. They will also have faith and will not generate a negative view. Marpa continued: The view and the practice of Dharma that I teach is extremely important, wondrous, and most unusual, because within the secret Vajrayana, there's a special link between the lama and the student. Whatever happens between the two of them happens in order to develop the qualities of the student. If anger arises, it's not a normal arising of anger. There is a purpose to it. All of the Dharma teachings that I brought back from India at the risk of my life, I will give to you. First, you have stayed eleven months in retreat, please tell us what kind of experience and what kind of realization you have attained. Milarepa responded: Thanks to the blessings of the Buddhas, the Bodhisattvas, my lama and his wife, I was able to attain a little bit of experience, a little bit of realization. In this completely matured body, this physical form of mine, it is possible to reach Buddhahood. This body is a boat that will take me across samsara to Buddhahood. However, it's also possible that I can use this very body to accumulate negative karma, and this will lead to rebirth in the hell realms. There is a choice. I can turn my mind towards positive activity and achieve Buddhahood in one lifetime or I can turn my mind toward negative activity and go to the hell realm. In order to cross over this fearsome ocean of samsara, the only protection is the Buddha, the Dharma and the Sangha. I go to them for refuge. Amongst these three, the most important is the lama. It is through faith and samaya with the lama that protection comes. There are also the four thoughts that turn the mind: the precious human rebirth, impermanence, karmic cause and effect, and the imperfections of samsara. Meditating upon these turns one's mind away from samsara. Then one generates bodhicitta, the mind of awakening, practices and dedicates any virtue for the benefit of all sentient beings. In this way, one enters the Mahayana path. (Milarepa spoke further, but this is a brief summary of what he said.) Within the Tibetan tradition, after one receives an introduction to the nature of the mind or some instruction from a lama and practices it, one offers to the lama one's experience of realization. Whatever happened during the practice, exactly as it happened, without exaggerating or without forgetting anything, one relates only to the lama, not anyone else. Marpa was extremely happy with Milarepa's account: This is most excellent. You are truly a karmically connected, strong student. And in the future I will give you progressively all the oral instructions, and you must then give yourself fully to these practices. After celebrating Milarepa's emergence from the retreat, Marpa gave him more instructions in private for his next meditation practice. Not long into the next retreat, though, a blue dakini with golden hair, eyebrows, and eyelashes appeared to Milarepa in a dream . She said to him, Practicing the Six Yogas of Naropa is very good. However, there is one teaching that has not been obtained. It's called 'The Instantaneous Attainment of Enlightenment.' It is a kind of powa practice enabling you to send your consciousness into another body after you die. You must go ask for this. Having given this advice, she disappeared. Milarepa then broke down the wall of his cave and went to Marpa, who was astounded to see him. Well, I just put you in retreat, what are you doing here? Why did you come out so quickly? Isn't this an obstacle to your practice? Milarepa explained to him that a dakini had appeared to him and told him that this teaching of powa had not been received and that it should be asked for. Was this appearance real or not? Was it a hindrance or not? Please tell me, he asked. Marpa replied, This is a true prophesy from a dakini. When I was with Naropa, he did speak of this kind of powa practice, but I really don't remember whether I have received the teachings or not. So they pulled out all the texts that Marpa had brought back from India, and spent days going through them looking for the teaching, but they could not find it. In the thick darkness of the north, like the sun glistening on the snow, there is one called Good News; it is to this one that I bow." It is said that at Pullahari, all the trees around the retreat hut of Naropa remain bowing towards Tibet. Naropa also gave Marpa many other teachings, including the Whispered Lineage of the Dakinis. He prophesied that, in the future, the Dharma lineage of Marpa would be masters of this practice, and that his Dharma descendants would maintain his lineage and practice it well. When Naropa had finished giving him these teachings, Marpa emerged from the hut, and once outside he bowed again to Naropa. (This was actually the last time he met him.) As Marpa was making his bows, he left a footprint in the rock that is still visible. When Marpa returned to Tibet, he gave Milarepa, his main disciple, every single initiation that he had received, including the Whispered Instructions of the Dakini lineage. Marpa told Milarepa and the assembled disciples, Now I have given you everything I received from Naropa. 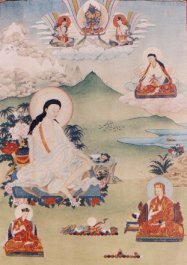 There were, however, other disciples of Naropa who received different teachings, and Marpa encouraged Milarepa and his other students to go and meet them in order to obtain the remaining instructions. In this way, Marpa's students would maintain Naropa's lineage. While Marpa was in India, Naropa had also prophesied to him that Milarepa should go back into retreat and pointed out a particular cave. Following these instructions, Milarepa went back into retreat, with the continuing support of Marpa and Dagmema. During this practice, he had deep experience and realization. After many years, Marpa called all of his students together. He said, We are maintaining the lineage of Naropa, and we should now look into the future to see what will happen to this lineage. Tonight, watch your dreams carefully, and in the morning, let me know what you've seen. Milarepa dreamt of four great pillars, one in each direction. In the eastern direction was Tsurton Wangye, one of the four main disciples. The snow lion on top of his pillar signified that he had a heart like a lion. In the southern direction was Lama Ngokpa, to whom Dagmema had sent Milarepa for teaching. On top of this pillar was a tiger, symbolizing the character of Lama Ngokpa. In the western direction was Meton of Tsangrong, and his symbol was the garuda. On the northern pillar was a vulture, and this represented Milarepa. Each one of the four has an extensive explanation but here we will focus on Milarepa. In Tibet, the vulture is considered a being who can endure all kinds of hardship. Vultures also come to eat the bodies that are offered at the cemeteries. They can even eat the bones, which indicates that they have a lot of fire in their bodies that allows them to digest anything. Milarepa's specialty was the practice of tummo, which is related to fire. In the dream, the vulture's feathers were all in place and they were beautiful with no fault whatsoever. This was a sign that all of the instructions Milarepa received would abide within his mindstream and he would remember them perfectly. The vulture's nest is usually high up on the rocks, and this was a sign that Milarepa would have a long life. Milarepa also dreamed that the vulture had many offspring, and that was a sign that Milarepa would have incomparable disciples. Flying around the vulture in the sky were many different kinds of birds. This was a sign that the Kagyu teachings would increase and spread. The vulture's eyes looked upward into the sky, signifying that Milarepa had cut his ties to samsara and that in the future, he would not need to take physical birth. At the end of the dream, the vulture flew into the sky, showing that Milarepa would reach the expanse of liberation, or the level of Buddhahood. After interpreting the dream, Marpa said, I have explained all this to you and my work now is finished. It's your turn, my disciples, to do the work. And if my words are not false, but true; and if they have the strength to endure, then in the future, this practice lineage will flourish. According to Marpa's prophesy, one of the little vultures represented Gampopa, who became one of Milarepa's foremost disciples. It is said that his sun-like disciple was Dakpo Laje, the doctor from Dakpo, or Gampopa, and that his moon-like disciple was Rechungpa, Rechung Dorje Drakpa. Milarepa had many other close and highly realized disciples who taught and matured their own disciples and so the lineage continued. Flowing from Milarepa's teaching and lineage, the Kagyu tradition did spread and flourish. This hagiography is based on a teaching given at Karma Triyana Dharmachakra by the Ven. Bardor Tulku Rinpoche in December of 1992, translated and edited by Michele Martin.